I tweeted about this exciting opportunity last week during the Walmart Saturday Morning Meeting, and now I now have the details on how you can get in on the Sam’s Club Savings Challenge! New members can score a Sam’s Club Membership that’s good through December 31st, 2008 for just $10! And it’s really easy to get started. Beginning tomorrow, Friday, October 17th, through Sunday, October 26th, consumers can visit any Sam’s Club to sign up. There are no strings attached. You just hand over $10 and you can test out shopping at Sam’s Club for a full 10 weeks. I’ve been a long-time member through my dad’s account, and I can tell you they have great holiday deals. So this could not have come at a better time for you all to take advantage of it! Check out all the details here, and if you decide to sign up, I’d love for you to come back and give me your honest opinion! Or if you’re a current member, tell me why shopping there is worth the membership fee! 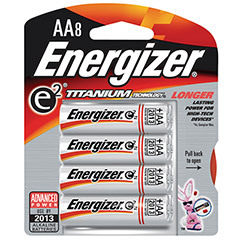 I found a fab deal on these Energizer Titanium Batteries at Meijer last night when I was picking up my 10 for $10 Kellogg’s cereal! They had 8-pks. clearanced at $3, and you can use this $1/1 printable coupon on them making them only $2 per package. These are the longer-lasting high-tech batteries for use in high-powered devices, so I’m sure these will come in handy for things like digital cameras and video cameras with the upcoming holidays! Here’s the newest deals to be found at Walmart! For the full list of current deals check out the Walmart Deals page! Keep in mind that Walmart’s prices vary by region, even by store within the same area, but generally they are reasonably close to the listed prices. Also, be aware that at times the coupons themselves may vary by region. You may find it helpful to print out and carry a copy of the Walmart corporate coupon policy with you. Have you found any stellar bargains at Walmart lately? Please feel free to email me so I can share them (while giving you credit, of course)! Along the same lines, if you find a deal is no longer valid because the coupon has expired or reached its print limit, it’s very helpful if you let me know so I can keep it current. Thanks for your help! For other store deals check out the Grocery Gathering hosted by BeCentsAble! $0.17 to $0.19 after coupon! Moneymaker after coupon and MIR! I’ve got some more hot deals for you at Walmart this week! And I’m looking for your feedback. This list can be rather cumbersome being so long, and many of the deals are good for weeks at a time. So I’m wondering if it would be more useful to you as readers if I just post the new deals separately each week and maintain an ongoing list of current deals that I can edit as deals die. $0.75/1 printable $0.17 to $0.19 after coupon! TIP: Purchase 3 Kool-Aid packets (a Kraft product) for 18 cents a piece for the best deal. $0.54 for Crystal Light and 3 packets of Kool-Aid! $0.54 for Kraft Dressing (16-oz.) and 3 packets of Kool-Aid! $0.54 for a Kraft Singles (12-oz.) and 3 packets of Kool-Aid! $0.54 for a Nabisco Wheat Thins and 3 packets of Kool-Aid! $0.54 for Oscar Mayer Hot Dogs and 3 packets of Kool-Aid! $0.50 to $0.65 after coupon! $4.06 for two refills and two warmers after 2 of each coupon! Have you found any stellar bargains at Walmart lately? Please feel free to email me so I can share them (while giving you credit, of course)!